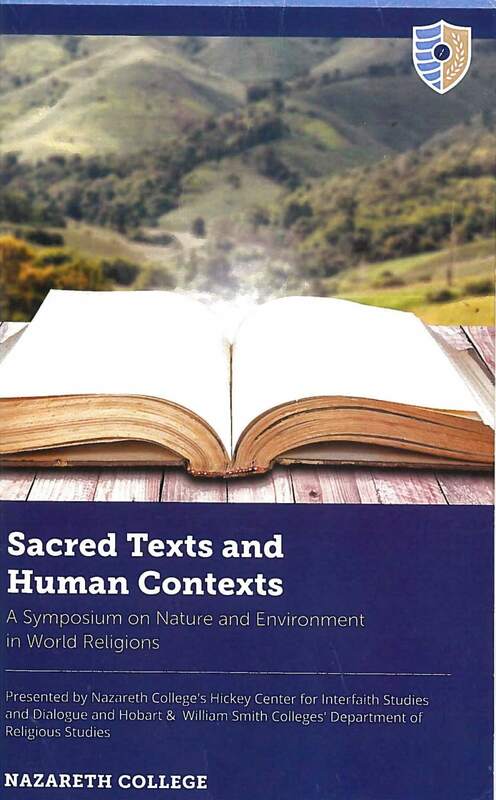 From May 23 – May 25, Nazareth College hosted Sacred Texts and Human Contexts: A Symposium on Nature and Environment in World Religions. The international conference, attended by scholars from as far away as Saudi Arabia, elaborated on how world religions have viewed nature and the environment. At the conference, I met Rick Reibstein, who has devoted his career to environmental protection and is currently a Lecturer at Boston University in Environmental Law, also teaching at the Harvard Extension School. Working within the environmental field, Rick was drawn to the conference as a unique opportunity for people from faith, academic, and environmental communities to converse — and learn from each other — on topics of shared concern. Our wide ranging conversation began with a question. What would a similar conference have talked about 50 years ago when the environmental movement was arguably first emerging? Rick suggested some topics would have been nuclear war, overpopulation, wildlife loss and pollution. Then — and in subsequent decades — Linus Pauling (1901 – 1994), Paul Ehrlich’s The Population Bomb (1968), Helen Caldicott’s Nuclear Madness (1974), Jonathan Schell’s The Fate of the Earth (1982), and Carl Sagan’s Nuclear Winter” (1983) would have been some of the figures and ur-texts referenced and discussed. Rick says on all fronts some progress has been made. The nuclear Test Ban, arms reduction, the end of the Cold War, the Endangered Species Act, the Clean Air and Water Acts. But, fundamentally, Rick thinks these positive developments often mask the reality that the “environmental catastrophe” is advancing not receding. Rick believes the situation is exponentially worse than 50 years ago. For example, debunkers aside, the Population Bomb is still ticking. And there are still more than enough Nuclear Bombs to destroy humanity many times over. Practical global sustainability is clearly at risk. Today, Rick thinks most people are anxiously aware of the damage being wrought to the environment. But the debate is too often narrowly focused on costs. Can we afford to protect and preserve the environment? Based on his decades of work in the environmental field, with an expertise in pollution, Rick says the answer is a resounding yes. For example, reducing pollution at its source can be done efficiently and inexpensively. Other sustainability-building endeavors are “entirely doable.” What needs to be harnessed is social and political will. My sister Leslie — an environmental engineer at Stanford’s Department of Sustainability and Energy Managment — has echoed Rick’s sentiment for years. We already know what will work — and how much it won’t cost. Nonetheless, Rick is hopeful. As was the subject of his talk, “The Environment and Faith in the Democratic Context,” one fundamental way to protect the environment is through faith in more democracy. By providing tools for participation in governance and the possibility of a universal perspective, democracy can be the catalyst for doing the doable. 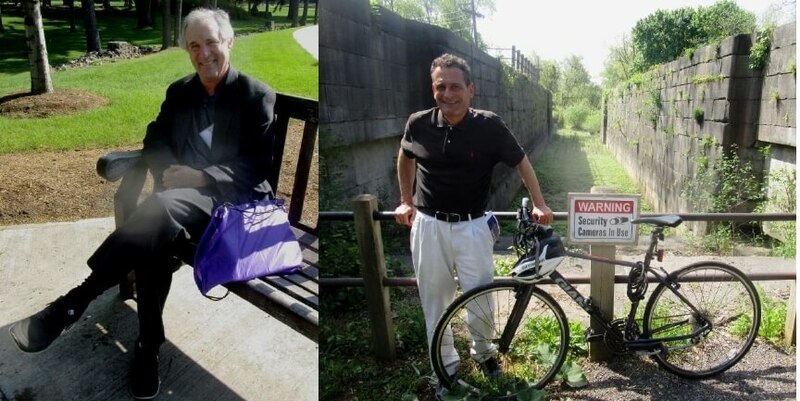 I also asked Rick if he would join me for a photo op at the nearby Lock 62 (where we’ve been before), explaining that the abandoned Erie Canal Lock behind Pittsford Plaza (one of Monroe Counties first suburban malls) and adjacent trail is moderately used by bikers, strollers and bird watchers, as well as a resting, eating, and yes, smoking spot for plaza workers. Rick had his presentation to give, but he could imagine the spot, and we took a moment to think about what Lock 62 might mean, metaphorically. First, I mentioned that much of the garbage in the swampy areas has been removed. 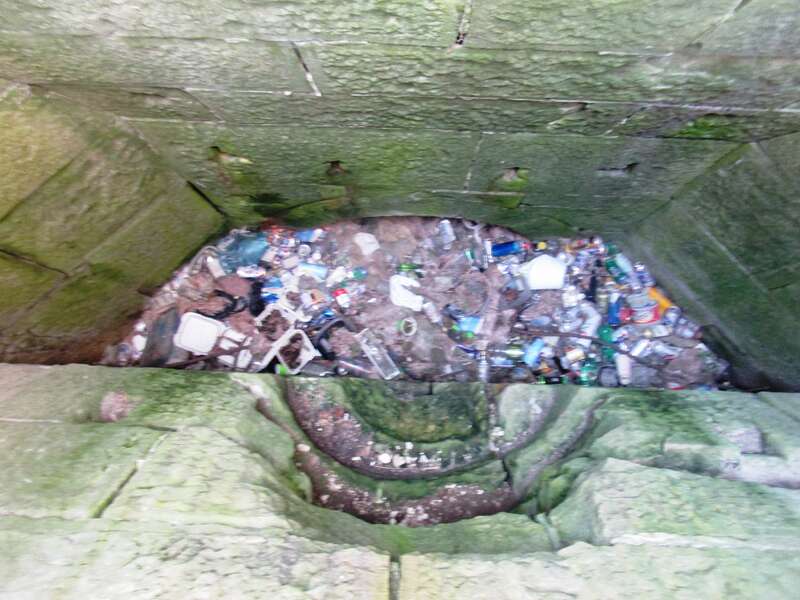 Although, if you peer down into the facing of the lock, you’ll see years of debris — like an archeological site — still deposited in the mini-cavern. To Rick, the cleaning up of trash is positive, but if we’re being somewhat metaphorical, where there are bottles, there is more. Toxins and minute plastics in the earth, tainted groundwater. As Rick said before, we need to prevent pollution at its source. I also mentioned a recent project by the Town of Pittsford to tear down some trees and broaden the path. Without going into all the details, I and others have been skeptical of this seemingly unfinished “Road to Nowhere” that looks pointless if not destructive. 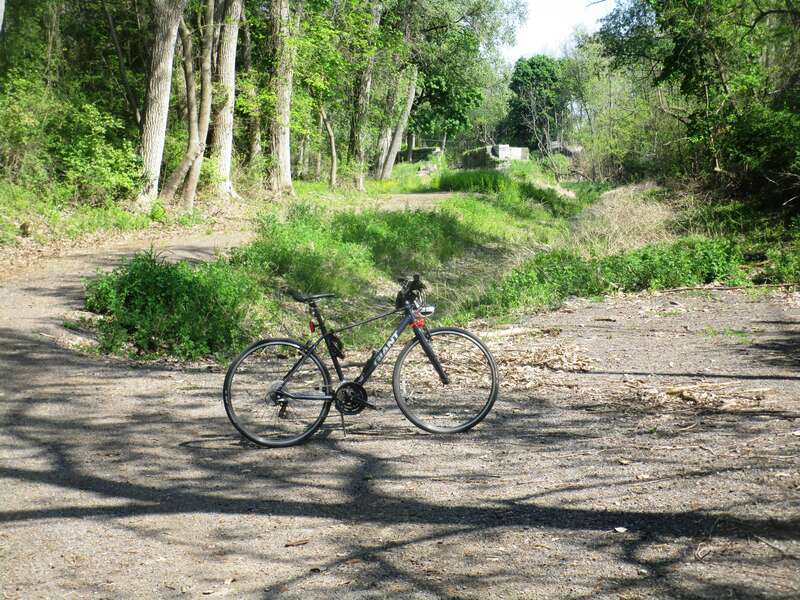 Without overgeneralizing from one example, Rick speculated that the Lock 62 Road to Nowhere — a very small scale emblem of environmental mismanagement — can represent what happens when government fails to properly recognize and meet the needs of its citizens. Maybe the Town of Pittsford needed more democratic input. We talked about the contrast between the small preserved parcel and trail and the sprawling plaza just below. Rick suggested the juxtaposition of the two opens questions about how we want to form as a community. Is it through consumerism — meeting superficially as shoppers — or through differently enriching activities like solitary and group strolls along Lock 62 trails? And, of course, while not the beaten path from the plaza parking lot into Wegmans, the trail is used. Before, after, and at break times, the plaza workers creep their way up the hill into the shade of the trees. 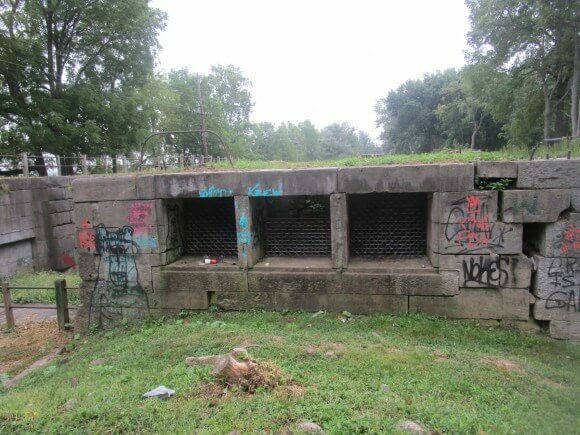 Rick wonders if people are drawn to Lock 62 in Pittsford on perhaps a semi-conscious level.There may be something innate that draws us to natural places not found in the man made world of all Pittsford Plazas. Finally, Rick doesn’t think the environmental movement is an issue of who won, or who might win: Lock 62 or the Plaza.There are many different paths to restoration.